I feel like I’ve always been very progressive and open-minded in the way I raise my kids, but something happened recently that really disturbed me. In fact, it completely shocked me and stopped me dead in my tracks. My son asked me to paint his nails. No, it wasn’t the fact that he wanted his nails painted that shocked me, it was the fact that when he asked me, I hesitated. I didn’t come right out and say, “Sure, honey, sit up there next to your sister and I’ll do yours, too.” I, who consider myself to be so tolerant that I don’t even like using the word “tolerant” because it implies having to tolerate something (which to me, has negative connotations), hesitated because getting a manicure felt like something boys don’t do. I have to admit, I was kind of disgusted with myself. I’ve never had any problems letting my son play with toys that are considered “girly,” and fortunately, my husband is not the macho sort to have a problem with that, either. I’ve never been the kind of parent – or person – to impose gender stereotypes on my children, or on any children. My son wanted a pink ball once, he got it. A glittery unicorn? No problem. Try on his sister’s hair bows? Sure, why not. He also loves dinosaurs, fire trucks, and sword-fighting. So does his little sister. But this nail-painting incident made me realize that everyone (including me) is pretty biased towards boys, particularly little boys who are just figuring out their place in the world. But think about it – because of women’s lib, most people would never think of telling their daughters, “No, you can’t play with those cars” or “No, pants are only for boys” or “No, you can’t be a firefighter for Halloween.” Anyone who said that to a little girl would experience the wrath of every woman within earshot. But that bias is exactly what many people impose on little boys who want to play with dolls, or watch a Barbie show, or…paint their nails like their sister. We tell them that they’re not allowed to explore certain little-kid things, because of our own adult hang-ups. I truly believe that when you’re a little kid, colors are just colors, toys are just toys, and putting paint on your nails is just plain fun. Grown-ups don’t need to sully the innocence of youthful curiosity by turning it into something it’s not. I still haven’t painted my son’s nails…yet. But the next time he asks, I know what my answer will be – and there won’t be a moment’s hesitation. 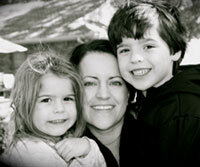 Jennifer Barling is a part-time freelance writer and full-time mother of two. She blogs for www.morethanmothers.com and has written for several local magazines, including FortWorthChild and 360 West Weddings. Jennifer spends her spare time trying to keep up with her energetic husband, creating new educational adventures for her children, and staying organized while doing it all!